Myron Mason, 50, of Leavenworth, Kansas(formerly of Schuyler) died Thursday, November 10, 2016, in Leavenworth. Funeral Service Thursday, November 17, 2016, 11:00 A.M.
Myron James Mason was born in Grand Island, Nebraska on April 4, 1966, the youngest of five children, to Marlen and Elvera Mason. The earliest years of life were spent with his siblings in rural Boelus, Nebraska, where he played outside for countless hours and soon found there was no end to both the fun and trouble one could get into in the country with an older brother and sisters. Myron and his family moved to Schuyler in 1970 where he graduated from high school in 1984. Always excelling in sports, his high school record for receiving yards in a season has never been broken. Myron went to Westmar University for one year, on a football scholarship before entering the United States Navy on November 5, 1985, where he was assigned to the navy lead ammunition type carrier, The S.S. Mount Hood, as a security/gunner in the Persian gulf. 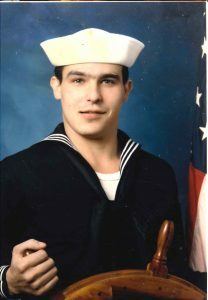 He was Honorably Discharged November 23, 1988 and has received full disability since his active duty for our country. Following his service to the country, he moved to The Colony, Texas where he met and married Sharaie Blue, on November 21, 1990. With her son, Terrell, they made their life together moving between Texas and Central Valley, New York, where he prided himself in his passion of cooking for various companies and watching Terrell grow into a fine young man. Following a divorce, he moved back to Nebraska for continued assistance with his disability through the Veterans Administration. Myron was presently living in Leavenworth, Kansas, with his very special friend, Michele Davenport. Their lives were better for having known each other and sharing their faith. Surviving Myron are his parents, Marlen and Elvera Mason of Columbus, Nebraska, stepson Terrell Robinson of Fort Lee, New Jersey, one brother, Marlen(Rhonda) Mason of Kingsley, Iowa, three sisters:SeAnn(Richard) Haynes, Lincoln, Nebraska, Cheryl Foreman of Kensington, Kansas, Kathy(DeWayne) Kracl, Schuyler, Nebraska, very special friend Michele Davenport, Leavenworth and 11 nieces and nephews.